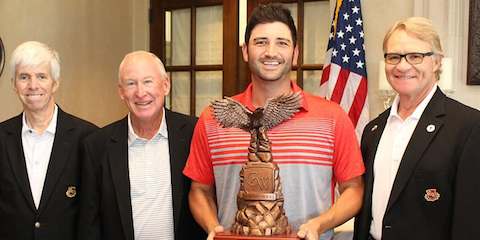 THE WOODLANDS, TX (May 4, 2017) – On a windy day when the rest of the field was busy moving backwards Justin Kaplan fired a 1-under 71 to finish 4-under and win the Carlton Woods Invitational at the Nicklaus Course of The Club at Carlton Woods. 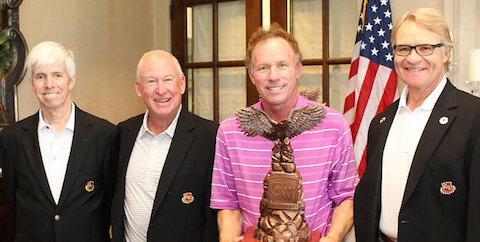 The 4-under effort was the new 54-hole scoring record for the course. Kaplan, a reinstated amateur, finished each of the first two rounds tied for the lead with Joseph Deraney but with his stellar final round play he was able to win by a comfortable seven-stroke margin. “[The 71] was better then the 67 on day one. It played really tough today. After a cool front came in last night the wind switched from the south to the north but I have played the course before and I knew it was going to be a long day and I just tried to grind it out. It was a very good round considering the conditions,” continued Kaplan. Kaplan was strong out of the gates birdieing his first hole thanks to a lob wedge to roughly ten feet and then like everybody else he spent the rest of the round trying to avoid trouble. For most of the day, although Kaplan did bogey the 2nd, 7th and 15th holes, Kaplan was able to stay focused throughout the round and in fact he saved some of his best golf for last as he birdied three of his last six holes and signed for a closing nine 2-under 34. The last two birdies on Nos. 16 and 18 served as an exclamation point for Kaplan on a day where he was the only player under-par. Joseph Deraney, who exploded onto the national scene in recent years struggled out of the gates and could never get it going on Thursday and he was forced to settle for a 3-over runner-up showing. Deraney, playing in his first career Carlton Woods Invitational was tied for the lead after each of the first two days but started his round with two double-bogeys and two bogeys in the first five holes to fall off the pace. Derek Busby was third at 4-over, Jess Bonneau took fourth at 5-over while Heat Myers ended up in fifth at 8-over.